This article explains some of the features and benefits of using products set up as a matrix in Bindo. Note that the information here applies only for matrix products that are already set up - if you do not know how to create a product matrix learn how to do so first: create a product matrix in Bindo. When you have a product matrix you can create a single shortcut button that represents all products in the matrix. 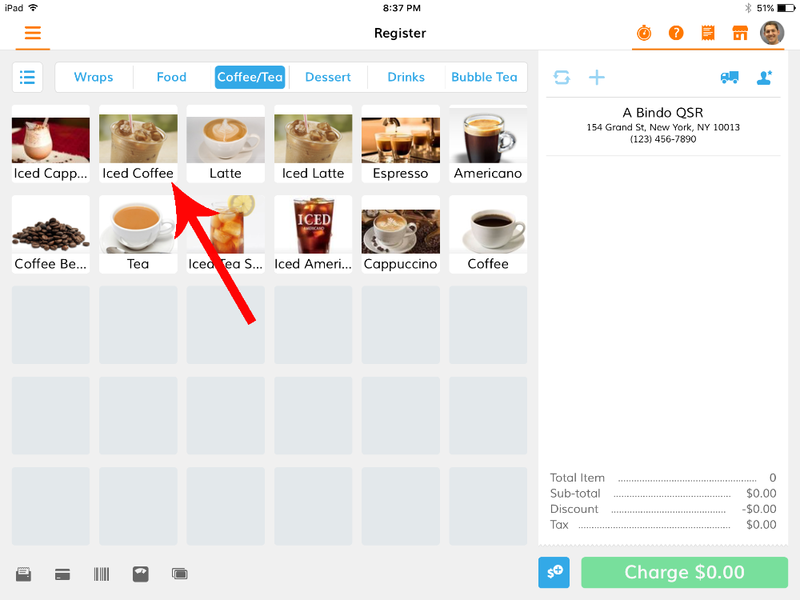 This allows you to organize your Favorites Grid more efficiently and save space on the register screen. Tap and hold a blank square on the favorites grid. Scroll or search through your inventory to locate the product matrix that you want to add as a shortcut/favorite. Make sure to select the parent product in the matrix. In the example below the parent product is "Iced Coffee". You can identify the parent product because it is not shaded or indented. All child products (there are three in the image below) within the matrix are indented below the parent product. Now when you tap on the "Iced Coffee" shortcut button a window appears containing all child products within the matrix. Tap on the product that you would like to add to the transaction. One of the benefits of the product matrix is that you can quickly manage all variations within a matrix on a purchase order in a single screen. 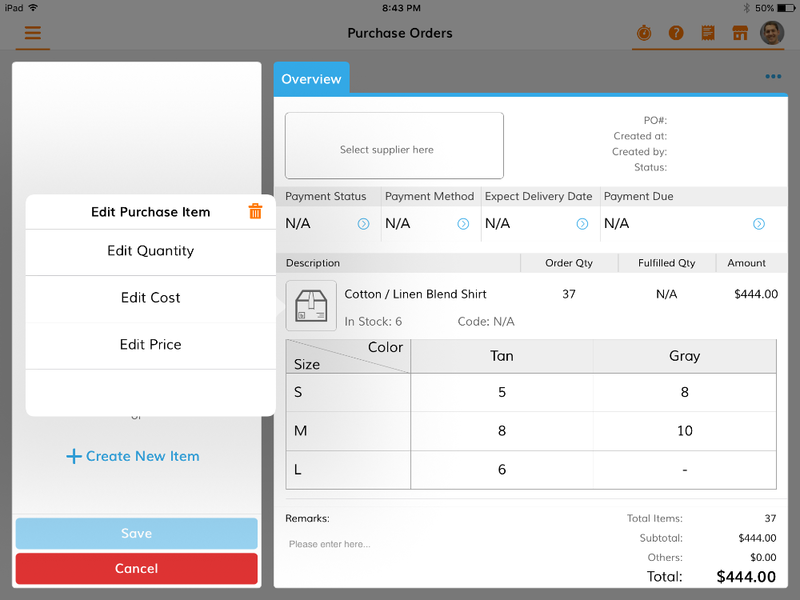 Navigate to sidebar → Purchase Orders and tap + to create a new purchase order. 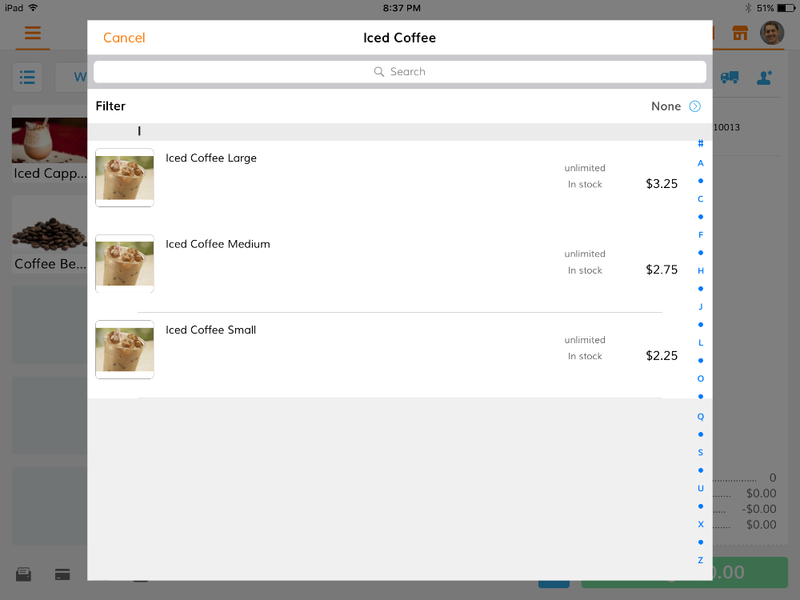 Tap "Choose Inventory" on the left-hand side, tap "Inventory" and scroll or search through your inventory to locate that you want to add to your order. 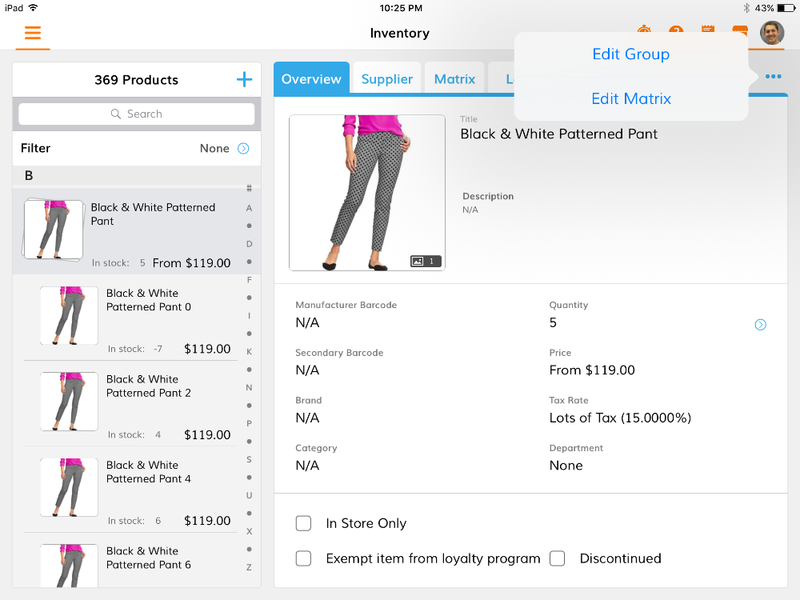 If the product you select is part of a matrix an "Order Quantity" window will appear with spaces for you to enter quantities for all products that are in the matrix. To leave any items off of the order leave the quantity for that line blank. Tap "Done" to save the quantities. 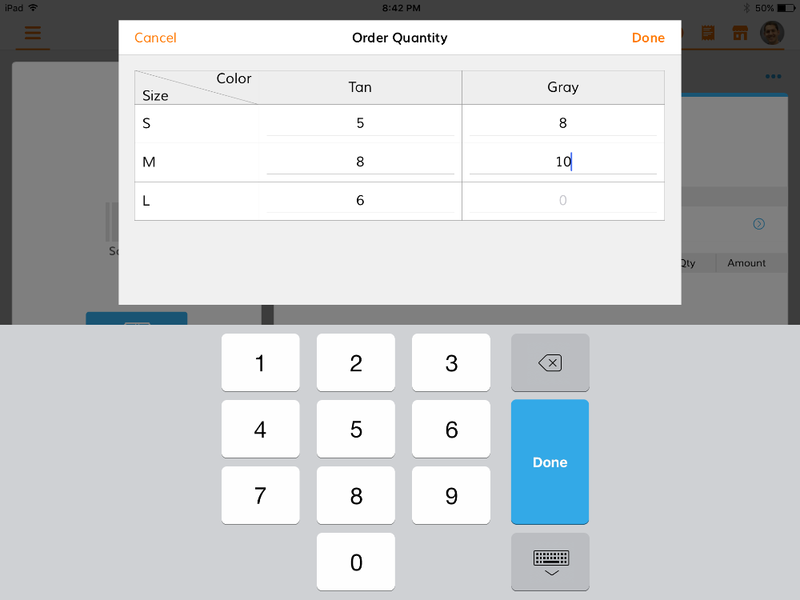 Edit other variables for these products or change the quantities by tapping on the product and selecting from the options displayed. Edit quantity, price, or cost for all products in the matrix from one screen. In addition to editing a product matrix from the Purchase Order screen as demonstrated in the above example, you may edit a product matrix from the Inventory page. The difference between editing an individual product and editing a product matrix is that when you edit a product matrix you are able to make changes to multiple products simultaneously. For example if you want to change the name for all products within a matrix you only have to change the name once, and not once for every item in the matrix. 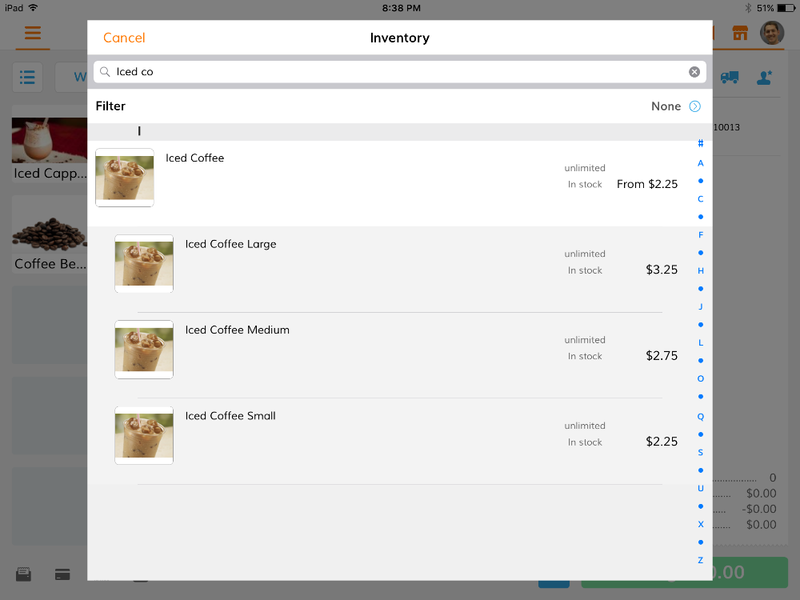 Navigate to sidebar → Inventory and locate the product that you want to edit. To edit a matrix you must navigate to a product that is the parent product in the matrix. You can identify the parent product because all child products are indented below a parent product, additionally a parent product has a price that is preceded by the word "From". In the example below "Black & White Patterned Pant" is the parent product of the matrix. Tap ••• in the upper right-hand corner and select "Edit Group" or "Edit Matrix". "Edit Group" applies if you want to make changes to the values that are shared among all products in the matrix, such as name, tax rate, department, or supplier information. "Edit Matrix" applies if you want to make changes to the values that are more likely to be unique to each product in the matrix such as price or quantity. "Edit Matrix" also applies if you want to add a new item to the matrix. 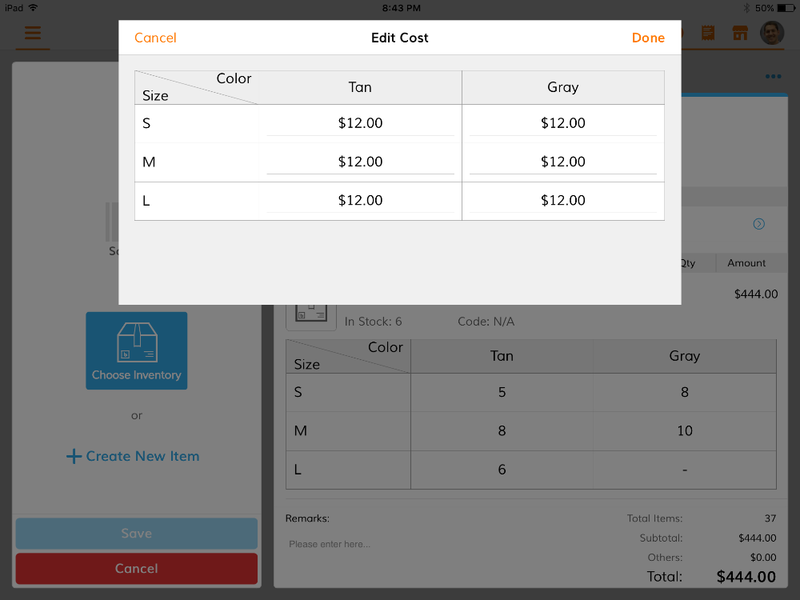 For "Edit Group" when you make changes and click "Save" in the lower left-hand corner an alert will appear to notify you that you are making a change to multiple products. As long as you want to make the change to all products in the matrix tap "Yes". For "Edit Matrix" click "Done" to save your edits.